The CAMRT joins dozens of other Canadian healthcare associations as a member of the Health Action Lobby (HEAL). Created in 1991, and representing more than 650,000 providers and consumer of health care,HEAL is dedicated to improving the health of Canadians and the quality of care they receive. The major focus of HEAL’s activities has been on the federal role in health and health care. 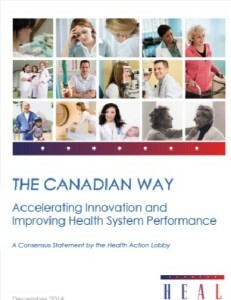 In December 2014, HEAL released its highly influential position statement entitled The Canadian Way. This Consensus Statement reflects an unprecedented level of agreement among health sector professionals and delivery organizations about the role of the federal government in improving the health of Canadians and the care they receive. It addresses many of the structural, demographic and financial challenges associated with the delivery of health care in Canada, and represents a call to action to all levels of government and our country’s political leadership. The CAMRT continues to work with HEAL to support advocacy efforts related to the recommendations made in the Canadian Way.